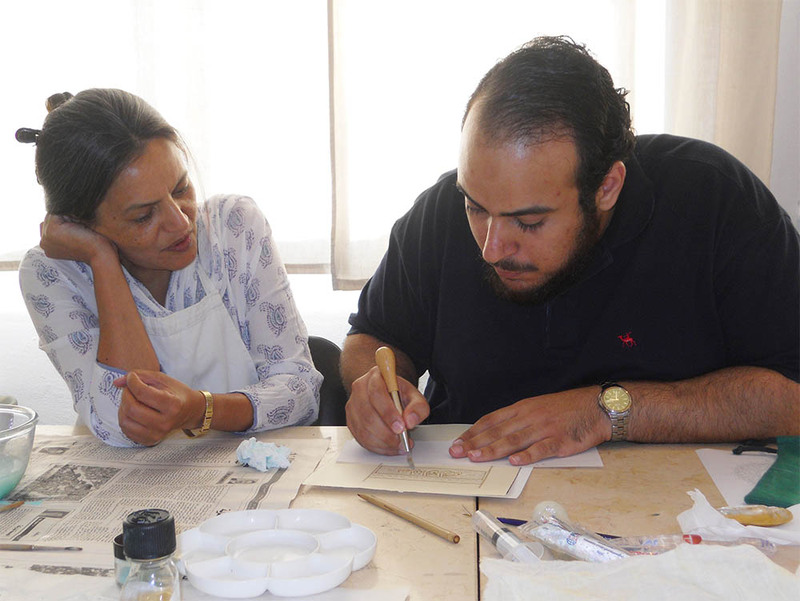 During my residency at the Dar al-Kutub project in Cairo, we decided to recreate a page from one of the manuscripts at the Dar al-Kutub, Egypt’s national library. We chose a sixteenth century copy of the Canon of Medicine – al-Qanun fi’l Tibb – of Avicenna – Ibn Sina. 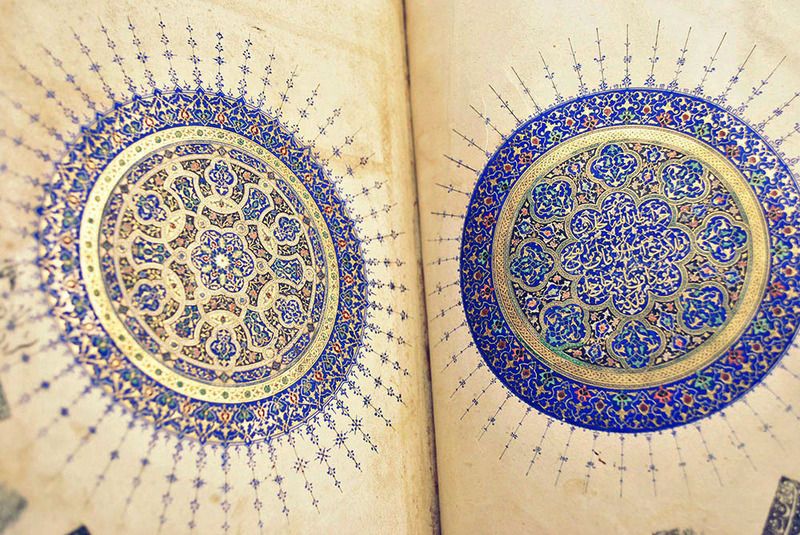 The title-page is illuminated in Safavid style, though probably produced in Egypt. In the main cartouche is the customary invocation to God – Bismillah ar-Rahman ar-Rahim – rendered in fine gold calligraphy. Below is the finished copy that we recreated – I left part of the illumination unfinished to show how the design is progressively built up in stages. Reconstruction of the title page of a 16th century Egyptian copy of Avicenna’s Canon of Medicine. and calligrapher would work together in the ateliers of the past. This was new territory for both Ahmed Fares and myself, so we had to feel our way empirically through the most logical progression and division of the work. The first stage of the work was the ruling out of the title-box. The entire device, including the ruling and the upper border is the opening title-box, known variously as the Sarlow, ‘Unvan or Masnavi. I still get very confused by the terminology of illuminated elements, as different scholars use different terminology, which further varies depending on whether the terms are Arabic or Persian. If anybody would like to comment I would be most interested. In any case, the ruling itself is so challenging that I am sure it was the work of a specialist. I use a nineteenth-century ruling pen for the black lines, and a straight brush and ruler for the gold and coloured lines. And I suffer acute anxiety every time! After the ruling was completed, I outlined the main features of the design in black with a fine Indian brush, including the empty cartouche which was to contain Ahmed Fares’ calligraphy. At this point I handed the page over to him to complete his work before I took it back to add colour and detail to the design. We felt that the heavy mineral pigments would smudge and inhibit his hand if I completed that part at this stage. I have written a little about the colours used for illumination in a previous post: “Pigments for Manuscript painting” . The palette for this piece included predominantly lapis lazuli and verdigris (which strangely had not degraded in the original), gold and touches of cinnabar and orpiment. All of which are also part of Avicenna’s Materia Medica! 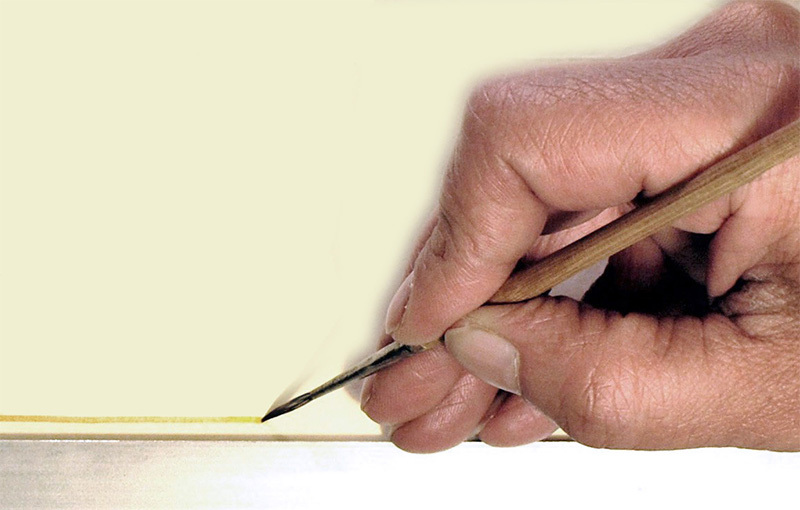 In the historical centres of book production of the Islamic world, there was an enduring hierarchy in the status of the different types of artists who worked on a production: the calligrapher’s art enjoyed the noblest status, this being literally the art of the word, followed by that of the illuminator (who illuminated the word). The work of the illustrators and margin decorators was subordinate to calligraphy and illumination, no matter how gifted the artists, their work being permitted only in the secular texts. Though division of labour into these separate elements was common, it was not unknown for exceptional artists to have mastered several or all of these arts. ” …..a letter is the source from which the light confined within it beams forth… spiritual geometry emanating from the pen of invention…” Contemporary Persian treatises abounded with complex recipes for calligrapher’s ink or Muraqab, adding to the basic formula of lamp-black and gum a plethora of other ingredients, such as gall-nut, saffron, cinnabar, verdigris, and scented resins to improve its beauty and viscosity, and calligraphers were trained rigorously for many years to master the precise aesthetic proportions of the various Arabic and Persian scripts. The paper they worked on was stained with vegetable dyes such as henna, producing subtle shades designed to minimize strain on the eyes of the reader, and carefully sized and burnished to provide a silky smooth surface for the calligrapher’s pen (qalam). The liquid gold that I prepared flowed smoothly off Ahmed Fares’ pen, I am happy to say, and when he burnished it with an agate, it shone like a flame. 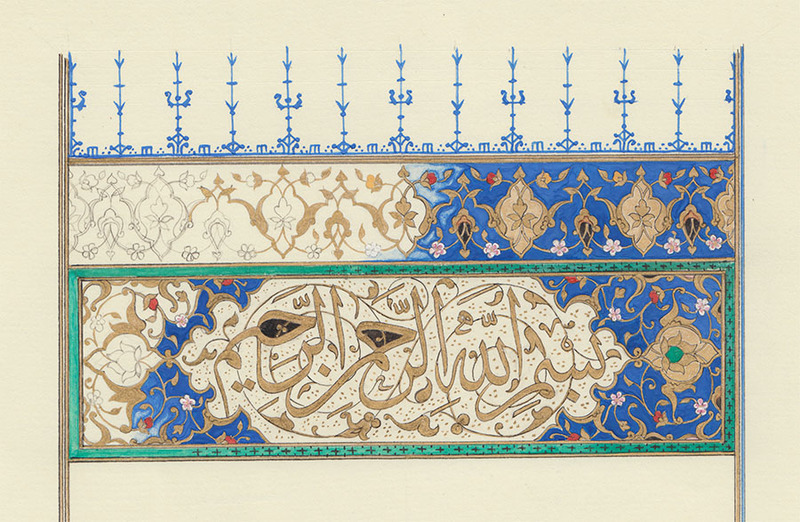 The calligraphy in the original was finely outlined with black, and interwoven with delicate Arabesques. The question was whether that was Ahmed Fares’ job as the calligrapher, or mine as the illuminator? 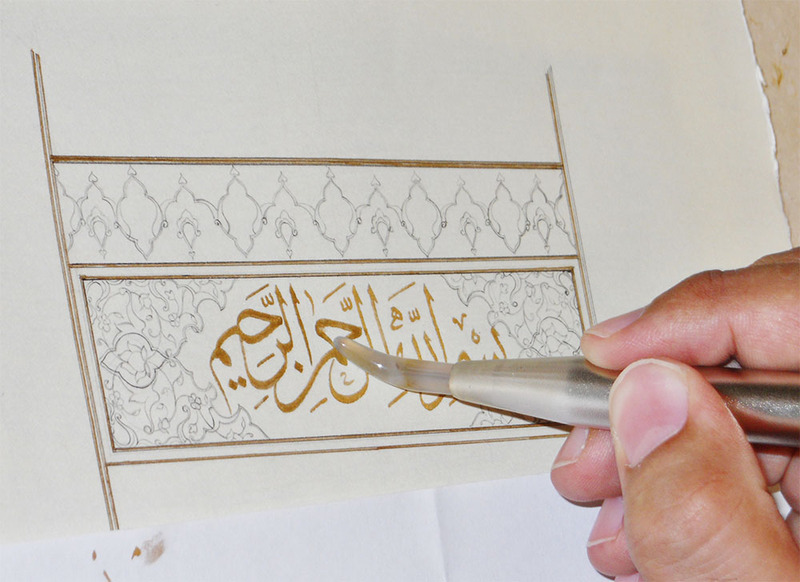 In fact Ahmed naturally took possession of that part of the illumination, leaving me to finish rendering the decorative elements around the cartouche. 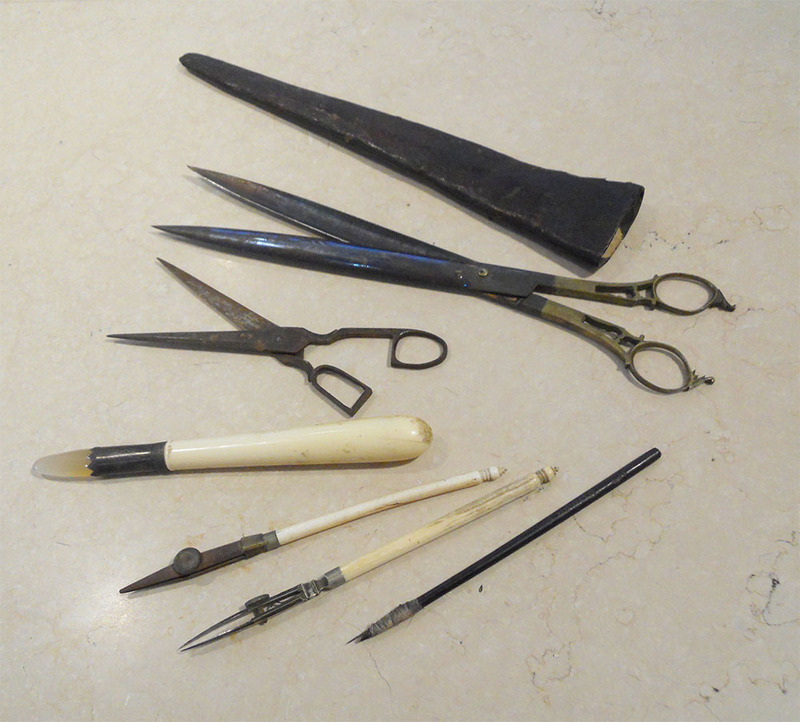 While he worked, I enjoyed examining Ahmed Fares’ collection of beautiful antique scissors, burnishers and ruling-pens, inherited from his Turkish master. Hello! I am spending my free moments this week reading through your blog and papers and I felt a little creepy doing so without saying hi. Thank you again for last week’s workshop, and for all the reading that will fill my free time now! Hello! 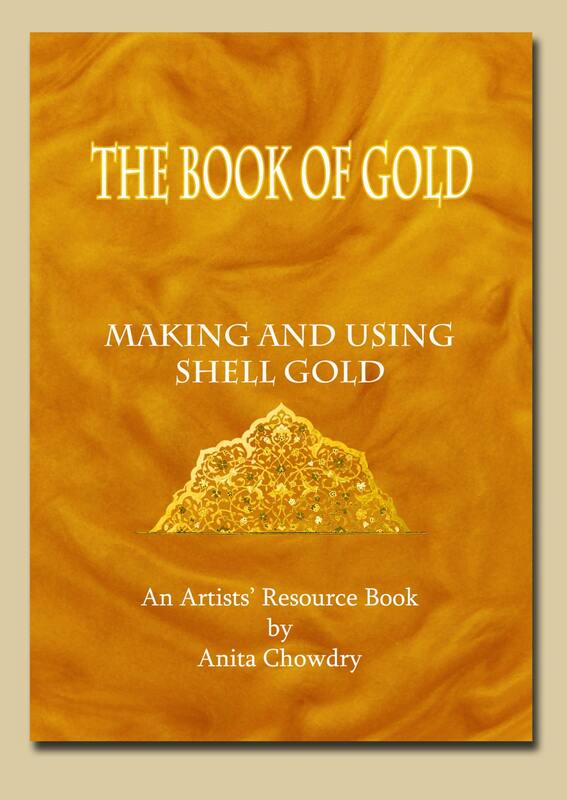 I am a calligrapher interested in learning more about using shell gold as part of my work- do you have any suggested resources or tips on how to get started? Thank you Anita! I’ll sign up for your newsletter, but I live in the States and am expecting my first child in the fall- I don’t know at this time how feasible it would be for me to get to one of your workshops! Do you know anyone in the US who teaches similar workshops? or resources with recipes and directions on how to grind my own? Thanks again! Beautiful work. I came back to look at the harmograph and found this fascinating post! I’m a natural product chemist by background and much interested in colour, synthetic, plant, bacterial, insect, or mineral. It’s wonderful to see your use of pigments and it makes me wonder whether we artificially enforce disciplines too early. I’m fascinated by how you move from the forge to the workshop to the atelier. Quite inspirational! Different from your recreation of Avicenna, but keeping to the Alchemical theme, is the project to digitally re-create Elias Asmole’s Theatrum Chemicum Britannicum. Your recreation of a page from Avicenna interested me both of itself, and because of two documents I recently acquired, one Persian and one thought to be Armenian. It was the calligraphy that initially attracted me, but it turns out that they are of historical interest too. I now have a post about them on Poemas del río Wang, a blog to which I am a (very) occasional contributor. Thanks for the link to the Cambridge meeting. I’d noticed it on the Alchemy discussion forum, but will have to miss it unfortunately. It would have been an opportunity to say “hello”. I did learn about Treadwells though, a bookshop I’d missed. Finally, you may find this link of interest. Note the harmonium!